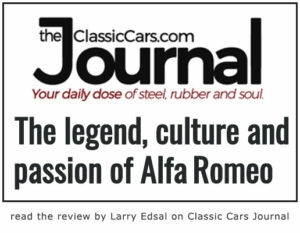 “The authors of this book are the members of the Registro Italiano Alfa Romeo (Riar). Their passion and enthusiasm allowed the birth of this association but also (and above all) the opportunity for many wonderful cars to tell the tale over time of the excellence of Made in Italy”: this is how Stefano d’Amico, founding Chairman of Riar, the Historical Alfa Romeo Register, introduced his latest literary effort titled: “Pure Alfa Romeo: Legend, Culture, Passion” (original Italian title “Pura Alfa Romeo, leggenda, cultura, passione”). 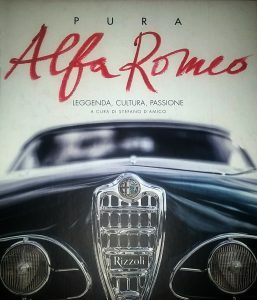 Published by Rizzoli and available for sale in all book stores, this book is introduced by legendary F1 and Formula Indy driver Mario Andretti, who in his preface tells about his intense passion for Alfa Romeo, his “buddy” in many battles on the racetrack. And it is indeed Stefano d’Amico’s love for this brand that emerges in every line of text in the book. After all, after 34 years as Riar’s Chairman, d’Amico has seen it all and here he explains, model by model, the true spirit of the Alfa Romeo cars. In the book there are a few “jewels”, such as a dedicated space for models often times neglected on previous publications – first among them, the Arna model – which, instead, represented very important steps in the history of the Biscione brand. Thus, a true cultural and historical reassessment of the past that must be considered in its entirety and in all its complexity. In other words, it is not all about the GTA, 33 Stradale or the extraordinary racing cars of the Ferrari House. Alfa Romeo is a much more complex story, all to be loved. From Nuvolari’s single-seater racecar to the Arna model. Kudos to d’Amico and to those who have the courage to push forward these ideas.